So we haven't had the craziest winter this year. None of our heavy duty winter boots have really gotten the chance to show their worth this year. I don't know about you, but I don't like trecking around in heavy duty winter boots if it's just raining or flurrying. I've put together a list of light boots that are ideal for cold, yet light winter weather and rain! Some new brands were thrown in here along with some fashion forward musts! Click on any image to be directed to where to buy each boot! This boot is great for those days that have only brought in a light amount of snow or a couple of inches. It is sheerling lined and water proof, so it will keep your feet warm and cozy through rain as well. I like this option because it's not as tall or as heavy duty as some other winter boots we've seen. This weather boot for those that want a more fashion forward look even in bad weather. Honestly, these are amazing! This is a heeled ankle rain boot, but Sorel also adds it's logo across a strap in the front. this is similar to something Alexander Wang would do. I love these because they are not your usual hunter boot and are a stylish alternative to the common rain-boot. The Bean boot. It's been a staple from L.L. Bean forever and is still picking up steam! Although they are common, it is for a reason. They are handmade weather proof boots, which again, are perfect for minor weather conditions. A rainy or light snow day is no match for these babies! Native boots are kind of an under the radar brand, but they are starting to gain popularity because of their reliability. These boots come in an array of colors and are waterproof, odor resistant, washable and shock absorbent among other things! Love these ankle boots from UGG! Ugg took a short break in most people's closets, but have developed new style that are winning our hearts again! I mean really, can you tell that these are by UGG?! Anyhow these boots are provide waterproof leather and construction, a cozy wool lining and nylon laces. Another Ugg boot, surprise! Taking what they do best, sheerling, and adding a new twist to it. I love the narrow leather body of the boot. This is a great option for those fashionistas that want to keep their looks on fleek even in the snow. This would be a great addition to an all black look! These boots are made of waterproof leather and lined with sheepskin for ultimate warmth. A tribute to the moon boot! I love how the laces pop against these puffy winter boots. They are thick and lined, which will definitely provide the warmth you need! They're a real throwback for anyone that had a pair like these in the past, but we all know that fashion and trends are always recycled. It is the moon boot's time once again! Here is another example of a fashionable perspective on a functional boot. Made by Joie and similar to the bean boot, it offers something different. The laces are a nice contrast against the navy body. They are great for light snow days and are always waterproof! This is a new find for me! This boot comes in different colors other than white, but why not match the snow for once?! This boot is lightweight and has a memory foam insole for extra comfort. The rubber outsole is cemented on, so there is no shot water is getting through! The winter season can still be fashionable! 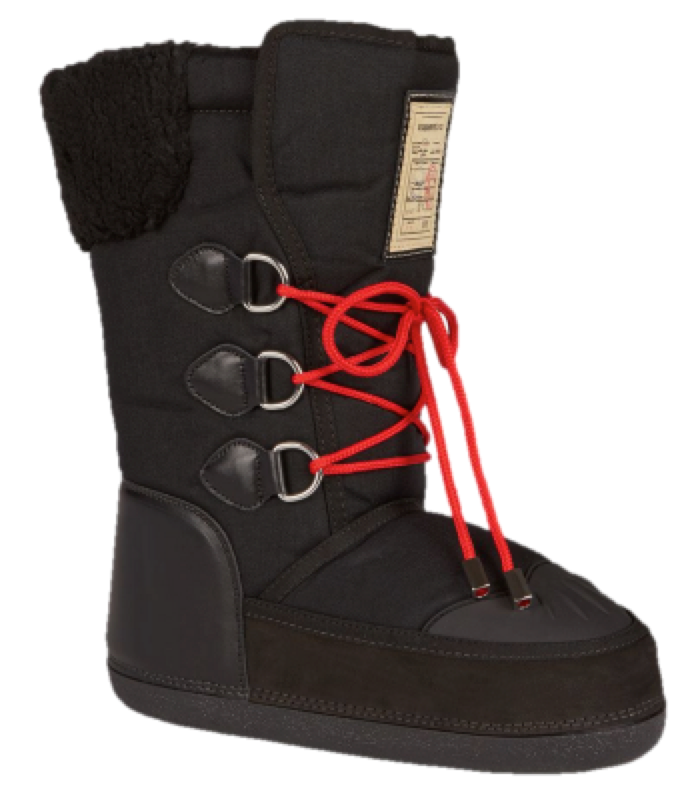 Just like the Sorel boot shown above, this one has a heel. But as you can see, there is obvious protection to the boot because of the dual material setup. This boot is made to withstand harsh weather conditions and look great while doing it. It features a removable insole that can handle up to -40 degrees celsius!